Scenic Harpers Ferry, West Virginia lies at the confluence of the Shenandoah and Potomac Rivers. For Appalachian Trail Hikers, Harpers Ferry is significant as the approximate mid-point of the 2,178-mile trail. 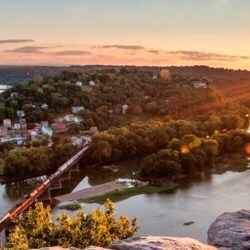 Harpers Ferry is home to the Appalachian Trail Conservancy (ATC), the headquarters for the AT. Harpers Ferry is perhaps best known for abolitionist John Brown’s October 16, 1859 raid on the federal armory there. Brown hoped the attack on the armory would spark a slave rebellion. The raid failed, but it did help to focus the nation’s attention on the growing tension between pro and anti-slavery factions. Just 18 months later, on April 12 - 14, 1861, Confederate General P.G.T. Beauregard bombarded Fort Sumter in South Carolina launching the Civil War. For those interested in Civil War history, Harpers Ferry is close to several battlefield sites. Antietam Battlefield is 17 miles away. Gettysburg Battlefield, in Pennsylvania, is approximately 60 miles northeast of Harpers Ferry. Manassas Battlefield is approximately 60 miles southeast in Virginia. The town of Harpers Ferry itself is a popular tourist destination offering restaurants, museums, and incredible views. Outdoor activities include rafting on the Shenandoah and Potomac rivers and hiking the many trails. Shenandoah National Park and Skyline Drive lie just to the south with an entrance to the park in Front Royal, Virginia.